Your Profile Section lets you how your name displays on your website or blog, your e-mail address for administrative purposes, other personal details, and personal options. 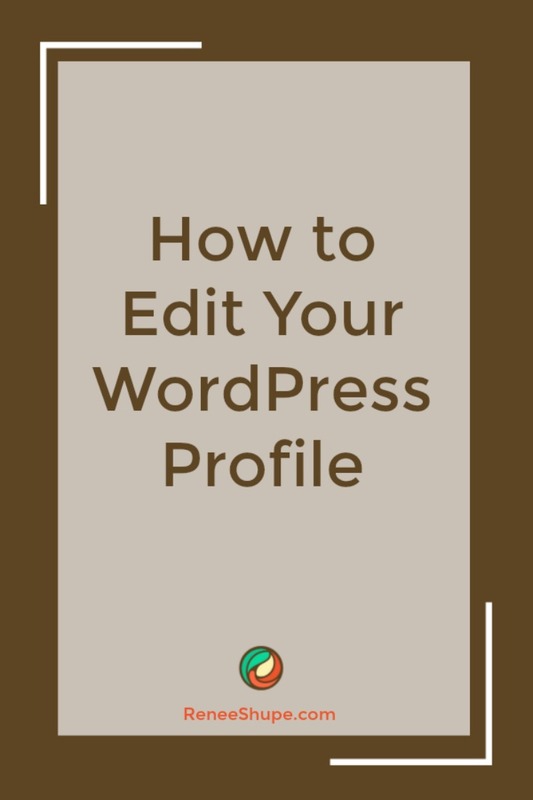 In this blog post you will learn about editing your WordPress user profile. You will also learn how to set up a user information box that will automatically link your published content to the Author Archives page of your site and how to use this feature to better promote users or their business online. 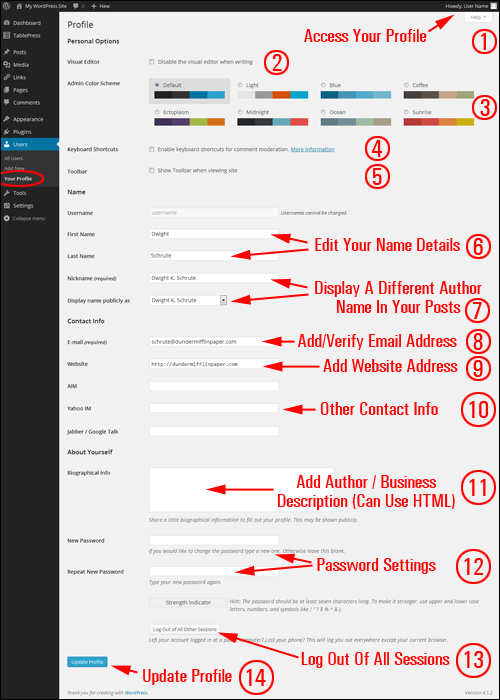 The Profile section contains various subsections that allow you to view and manage information about your WordPress user account. Please refer to the above image as you go through the sections below. 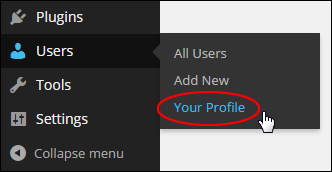 As we’ve already mentioned, you can access your profile by clicking on the “Howdy, User Name” tab at the very top right hand corner of your admin screen and selecting “Edit My Profile” from the drop-down menu, or selecting Users > Your Profile from the dashboard menu. 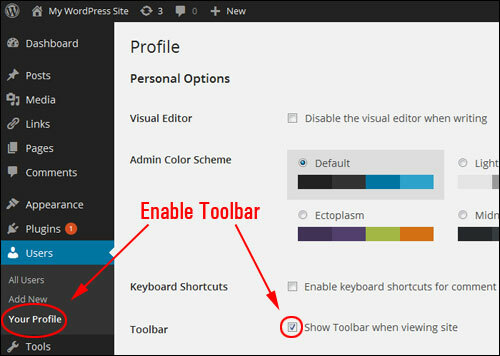 You can ignore this section, unless you specifically want to customize aspects of your WordPress site administration area that are only viewable to you (and no one else) such as disabling the visual editor when writing, changing the admin area’s color scheme, or enabling keyboard shortcuts for comment moderation. Ticking this box disables the visual editor and uses the plain HTML editor instead. Tip: If you experience issues when trying to add code to your content (e.g. HTML), try disabling the visual editor by ticking the checkbox in this section. 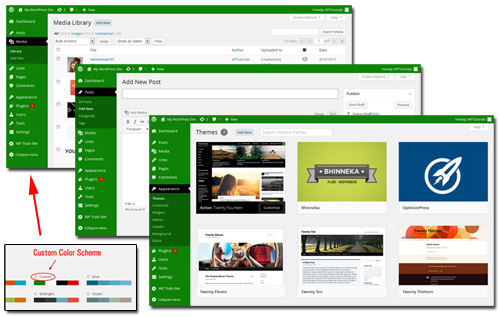 Although this has no impact on what your blog visitors see (the look of your site is controlled by themes) or the functional aspects of your site, this feature can be used to brand the admin area with your corporate colors, or allowing other site users to personalize their own dashboard area. 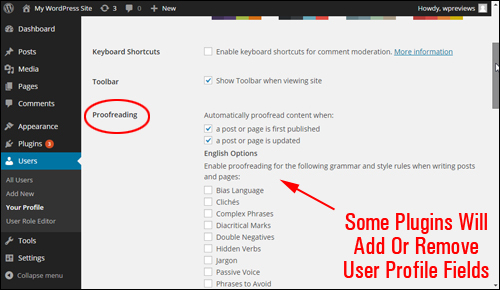 Ticking the Enable keyboard shortcuts for comment moderation box allow you to rapidly navigate and perform actions to moderate comments using keyboard shortcuts. Important: Leave the “Show Toolbar when viewing site” check box ticked to display the Toolbar in your WP dashboard. You cannot change the username in the User Profile section. You can, however, change your username if you know how to edit your WP database. 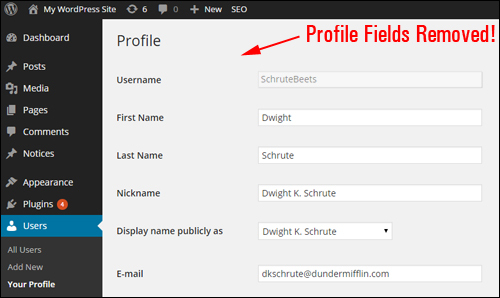 You can also change your username inside the WP Admin area using a simpler method that requires no messing with code or modifying your site’s database. 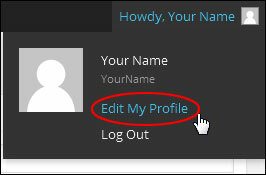 Changing your username will affect your login, as this username is required for logging into your WordPress site! You can modify the First Name and Last Name data in this section. You can add multiple nicknames in your profile section. Once you select a nickname, all your posts, published comments, etc. will appear with this new nickname, instead of the one that you originally installed WordPress with. Make sure that your correct email address has been entered in the Email (required) field. This is a required field (see “Notes” section below for more information). Enter the address of your website or blog into the Website field. If you have another website or business blog that you want to display in your profile, then enter the address for that website or blog instead. You can enter details for the other Contact Info section fields, or just ignore these. 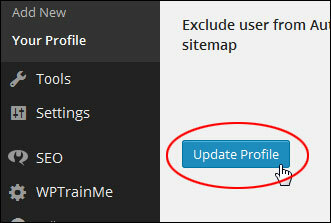 For more details about using this feature, see the “WordPress User Profile: Additional Contact Information” section further below. 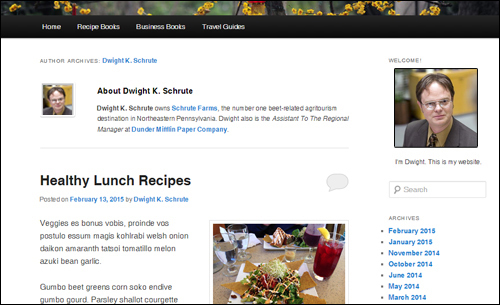 In this section, you can insert a personal or business description for your visitors or site readers. 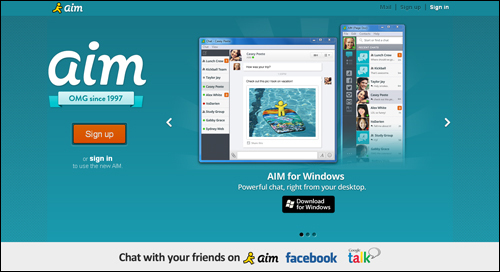 For more details about using this feature, refer to the “User Profile: Useful Tips” section further below. Here you can change your login password details. Use this section only if you are required to modify or reset your login password. You will need to enter the new password twice before the system can accept the password change. WordPress lets you log out of all current sessions except your current browser. This is useful if, for example, you have left your account logged in at a public computer, or if you’ve lost or misplaced your phone. 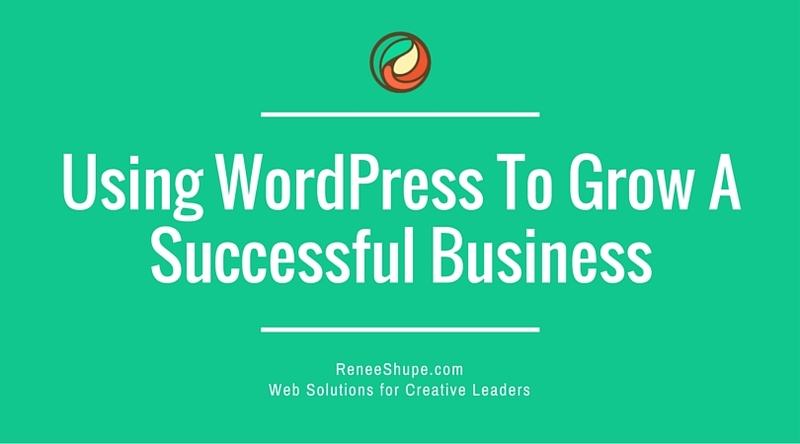 WordPress only requires your email address and a nickname. 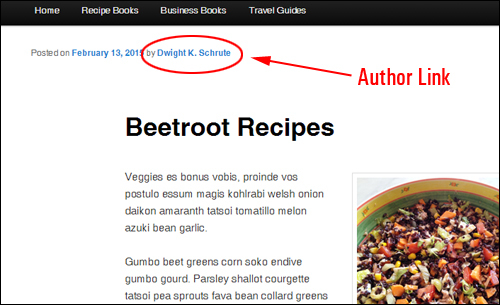 Your email address is used only for your blog administration. The email address on your profile is never sent to any other site (including WordPress) and it is never displayed on your site (unless you publish it, or use a WordPress theme that has been encoded to display the email address). Only registered users of your blog have access to the email address you have provided. Each email address must be unique. 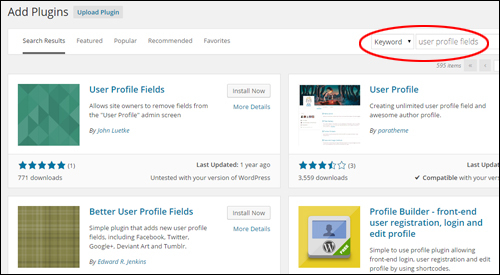 See Tip #3 in the “WordPress User Profile: Additional Information” section further below for an example of a free plugin that lets you remove unnecessary fields in the Profile area. Normally, you would simply leave these fields empty. Some WordPress theme developers, however, may choose to customize their templates to display this and other contact information. If this is the case, then you can choose to set up accounts with these services (if you haven’t already done so) and then add your details to the appropriate fields in the Contact Info section. 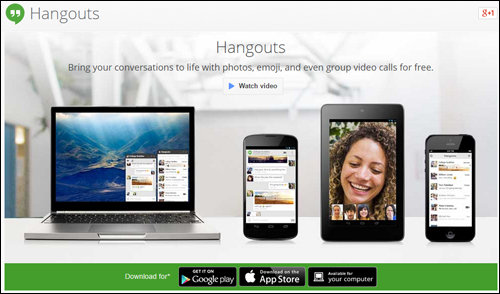 Although this field says “Jabber / Google Talk”, if you click on the link in this section, you will actually be taken to Google Hangouts. Tip #2: Your user profile gives you an additional opportunity to promote your business to your site visitors.